The appropriately titled ‘Song of Endings’ arc concludes here with this, the final issue of Uncanny Inhumans before the book becomes fully embroiled in the Inhumans versus X-Men cross-over. It’s a lovely send off from the creative team of Charles Soule, Adriano Di Benedetto, R.B. Silva, Andrew Crossley and Java Tartaglia. Full recap and review following the jump.Auran had been a dutiful citizen of old Attilan, an officer in the security forces, and single mother to her twin teenage daughters, Irelle and Treste. 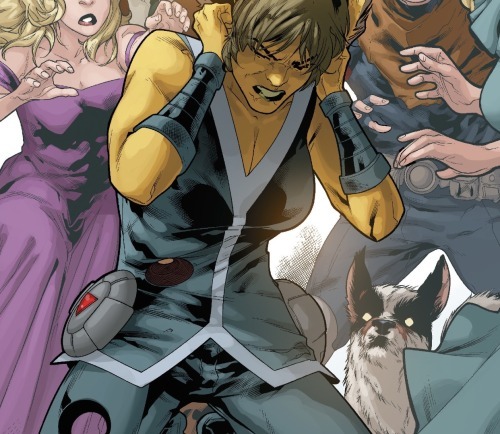 Auran was killed in the line of duty by Maximus who used his mental control over Black Bolt to force the former king to destroy her. In the wake of this terrible loss, Auran’s grief-stricken daughters chose to stop at nothing in their desperate efforts to somehow bring her back. The twins had discovered that their fellow Inhuman, Reader, had the ability to bring into reality anything that he reads. Irelle and Treste spent months compiling a written history of their mother, writing down their own memories along with any and all stories they could find from the people who knew Auran. They then coerced Reader to read their finished product and it resulted in the re-manifestation of a being resembling their mother. And yet a person is much more than the mere sum of others recollections and the being whom Reader manifested was incomplete; all of the various secrets left untold and private aspects unknown were represented by literal holes, agonizing voids in this new Auran’s body. Confused and in great pain, this new Auran lashed out, seeking revenge on the man who had killed her. The various authors who contributed to the book Irelle and Treste compiled did not fully understand the actual nature of Auran’s particular Inhuman gifts. They knew her powers had something to do with sound and hearing… and yet the lack of specificity ended up endowing this new Auran with essentially unlimited power over sound, hearing, and voice. A power she used to take from Black Bolt his hugely destructive voice. The last issue ended with Black Bolt rushing to cover Auran’s mouth. She had taken his power, but had not learned to control it. A mere utterance could now destroy all of midtown Manhattan. By making a sound Auran could have her revenge, she could possibly end her suffering, but doing so would destroy everything, including her daughters. She chooses to remain quiet, but for how long? Black Bolt had spent the entirety of his childhood and adolescence mastering the skills and diligence needed to be completely silent; to stifle every cough and repress every urge to speak. And now Auran is asked to do this with no such training or practice. She will try yet it is clear that her efforts may fail at any moment.One might think that a lifetime of not speaking would leave Black Bolt a laconic sort, a tentative speaker. It’s not the case. Black Bolt issues forth orders with confidence and decisiveness. He has Treste and Irelle stay with their mother, orders the club vacated, commands Frank McGee to use his contacts in the human world to have midtown evacuated, and asks that Flagman assist in ensuring that Auran remain quiet. It’s wild seeing Black Bolt speak and interesting to see how precise he is with the words he chooses. There is no sense of abstraction in what he says, no use of metaphor or hyperbole. He speaks like someone who knows all too well how powerful words can be.The scene switches to New Attilan where Medusa is attending to the governance of the city. Repairs are still being conducted following the altercation with Tony Stark’s army of Iron Men. 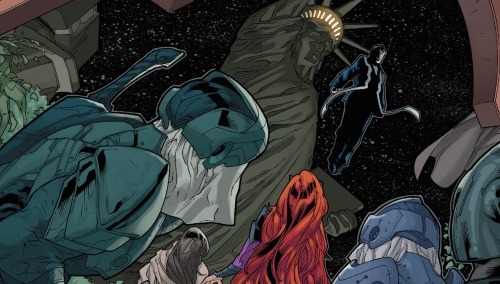 Suddenly Black Bolt floats in from above, a rather dramatic entrance neatly illustrated with the Statue of Liberty in the background. Medusa is quite shocked when Black Bolt speaks with a regular voice. He efficiently relays what has happened. Medusa quickly guesses what, or rather who, has brought Black Bolt to New Attilan. He is in need of the Inhuman telepath, Sterlion.Back in the Quiet Room, Auran continues to struggle to remain absolutely silent. Flagman has stretched out his ribbon-like appendages so to bind Auran, to keep her mouth closed. It turns out that Flagman is much tougher than I had previously thought him to be. Auran breaks her concentration and utters a sound, yet Flagman’s ribbons are able to contain it, though just barely and it clearly injury him. He won’t be able to contain such a thing a second time. It looks as though Auran is going to break again. Her eyes glaze over with an odd glow. Flagman, Irelle and Treste all prepare for the worst, but it doesn’t occur. Auran has actually been entranced by the telepathic powers of Sterlion. The scene switches to the psychic plain where Sterlion and Auran can communicate safely with one another. Within this plain Auran’s appearance is representative of how she feels: an incomplete monster, discrete memories, thoughts and feelings haphazardly cobbled together. Sterlion uses his powers to ease her pain; he can fix her, mollify the voids and make her feel whole, but there is a crucial decision to be made first. 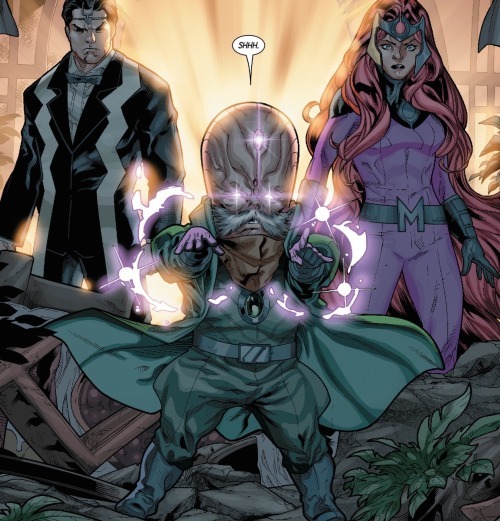 Sterlion steps out of his psychic rapport with Auran to speak briefly with Black Bolt and Medusa. He states that he will be able to repair Auarn’s incomplete body and mind; she won’t be the same as she was, but she will live. Furthermore, the matter offers an opportunity. 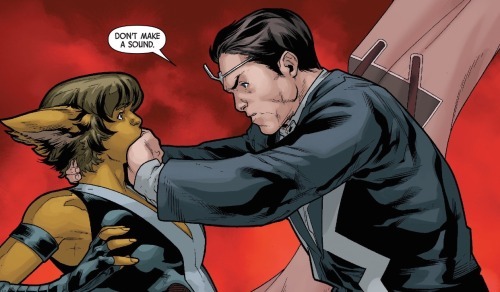 Auran’s unspecific power over sound offers her temporary control of Black Bolt’s voice. 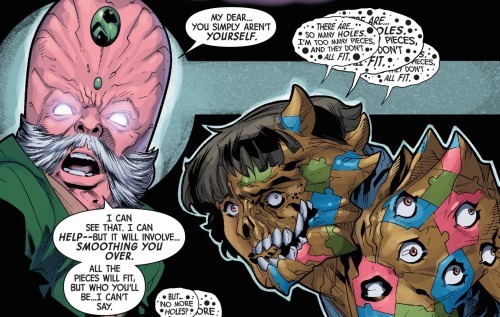 Sterlion can have her put the voice back into Black Bolt or he can have her destroy it, thus freeing Black Bolt from the overwhelming responsibilities entailed in this power. It is a difficult decision to make, but one that Black Bolt makes quickly. Possessing this power has kept the Inhumans safe, it is the supreme deterrent that prevents others from taking action against New Attilan. If word got out that Black Bolt had lost this power then it would only be a matter of time before The Mutants, The US Government, or any of The Inhumans’ enemies would lay siege to New Attilan.Medusa tries to convince him otherwise. The Inhumans had survived for generations before the advent of Black Bolt’s powers, and would surely be able to survive without them. No one would blame or condemn Black Bolt for relinquishing himself from this awesome responsibility. Black Bolt disagrees; he would blame himself. He is no longer king but still very much feels it his duty to take every action and make every sacrifice needed to protect his people. He commands Sterlion to have Auran put the voice back in him. Once more shackling Black Bolt to the solitude of remaining forever quiet. 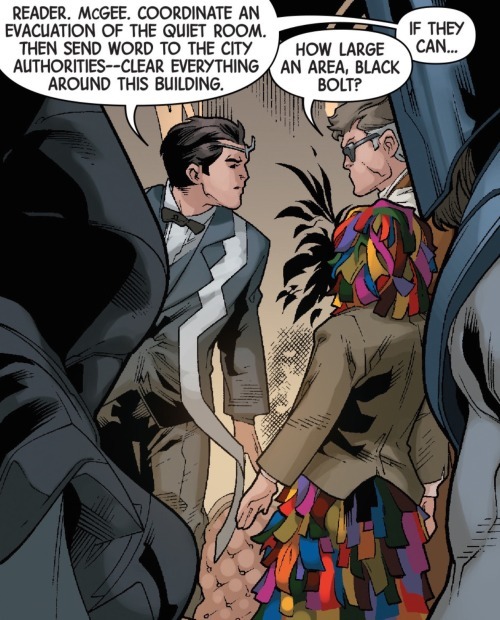 It makes for an interesting new facet to Black Bolt’s story. The nature of his powers has always been presented as equal parts curse as well as gift. Black Bolt was born with these powers, his initial cry as a newborn all but destroyed the birthing center on Old Attilan. Learning to control and master this power forced him into a life of near absolute seclusion, self-control, and diligence. And he accepted this fate with stoicism. Offering Black Bolt the opportunity to free himself of this awesome responsibility is an interesting twist. It reframes the burden of it all as something that Black Bolt has the choice to take on. And he chooses as one would expect him to; he acts as any king (or former king) would by accepted self-sacrifice so to ensure the wellbeing of his people. Sterlion does as he is ordered. The voice is returned to Black Bolt and Auran herself is made whole. An epilog shows the new Auran taking a moment to reconnect with her daughters.Treste and Irelle are her daughters, yet they also aren’t. This is a new Auran and one who is not yet sure who she truly is. Auran is invited to come live with Treste, Irelle and Frank, but she declines. She needs to go out and make authentic memories, discover herself as the new being that she has become. She takes her leave but it isn’t a goodbye; it is simply a farewell for now. And it is here the issue ends. Charles Soule is still writing the three tie-in issues to IvX and co-writing the IvX series in and of itself. Yet this issue is very much the last purely Inhuman story Soule will tell. 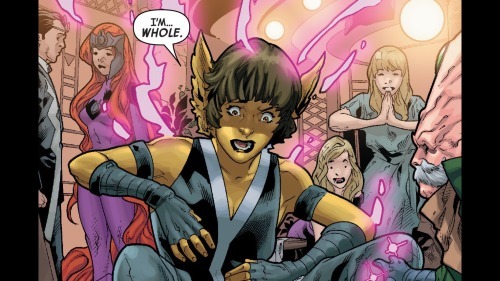 Auran’s saying this is not goodbye but rather farewell feels sort of like Soule himself speaking to all the readers who have joined him for his two-plus year stewardship of the Inhumans. He’ll be leaving The Inhumans in the spring, handing the reins over to Al Ewing, Saladin Ahmed, and Mathew Rosenbaum. And yet it clear that it is not ‘goodbye forever,’ but rather ‘farewell for now.’In any case, it is difficult for me to look at the issue and this story-arc on its own, separated from the entirety of Soul’s run on The Inhumans. It’s a fun story and an interesting dissemblance of the inexact nature of memory and the power of words. The art seems a bit rushed in places, Silva’s and Di Benedetto’s pencil-work doesn’t always coalesce as well as it should, but the illustration is overall quite good and the colors by Crossley and Tartaglia are just wonderful. 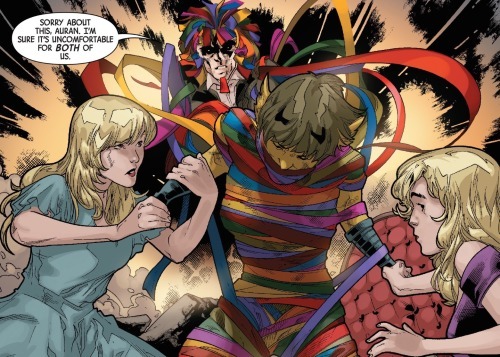 The coloring of Flagman’s various multicolored ribbons is especially impressive (I can only imagine what an arduous affair coloring Flagman must be).At risk of sounding egocentric, this story felt like Soule’s way of saying thanks and farewell to all of us fans who have accompanied him throughout his tenure on The Inhumans. Who is to say whether or not this is indeed the case? Regardless, that is how I’ve chosen to interpret it and I greatly appreciate it.Soule was hoisted into writing the Inhumans, stepping in at the last minute after the unexpected parting of ways between Marvel and Matt Fraction. And he’s done a wonderful job, creating an all new vision of The Inhumans while simultaneously navigating through the seemingly endless barrage of event books and editorial demands. 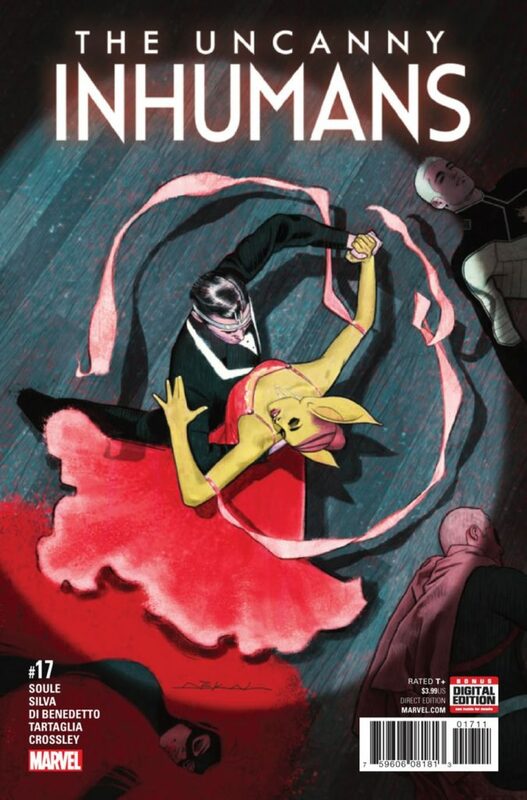 At a scheduled twenty issues, Uncanny Inhumans has been the longest Inhumans series to date. The seventeen issues that have come thus far have all been terrific… some better than others, but not a dud in the group. It is a remarkable achievement and Mr. Soule has my utmost gratitude.And I’m glad that this is not goodbye but rather farewell for now. Recommended, four out of five Lockjaws.